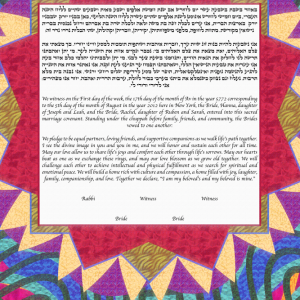 The World Ketubah bursts with stunning colors and dynamic patterns against a simple white background — the perfect Ketubah to emphasize the importance of this beautiful tradition. 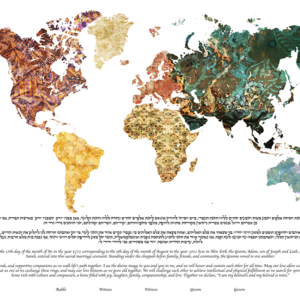 This design features a sprawling world map with the Ketubah text underneath. The dramatic blend of lively patterns and shades against the minimalist background creates the perfect modern feel to this gorgeous design. This Ketubah is perfect for the couple that loves travel, culture and tons of adventure! The world map is the perfect design to represent your unique love and emphasize the beauty of diversity. The World Ketubah is the perfect design to start out the most important adventure of your lives — the adventure of marriage! The Underwater Ketubah captures the beauty of ocean life and companionship — the perfect theme for a modern Ketubah! This stunning work of art features the shadow of two whales swimming in a deep blue ocean. The crystal waters and reflections bounce off one another, creating a beautiful luminous feel to this design. The Ketubah text is outlined in black to bring emphasis, while still integrating itself into the overall design seamlessly. This Ketubah is perfect for the couple that loves the ocean and have a passion for animals and nature! The sparkling waters and abstract style create a spiritual depth in both meaning and design. 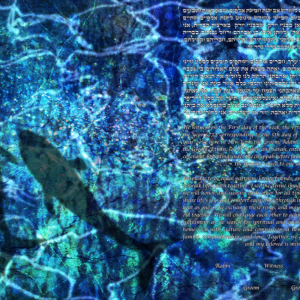 Although seemingly subtle, the Underwater Ketubah captures so much more than a snapshot of nature — it's a design that will represent your marriage and commitment for the rest of your life. The dragon has been an iconic symbol through Whales and many other Celtic cultures for over a thousand years. The Welsh Dragon Ketubah captures the beauty of Welsh history and blends it with the Ketubah tradition — creating a design that holds both antique richness and diverse style. This design features a bold red dragon against a green and white background. 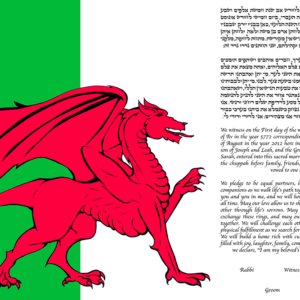 The Welsh Dragon Ketubah is perfect for the couple that has Welsh roots, or simply adore the Celtic style! The stately dragon on the left beautifully represents history and culture, while the Ketubah text to the right represents the love and commitment you both share. 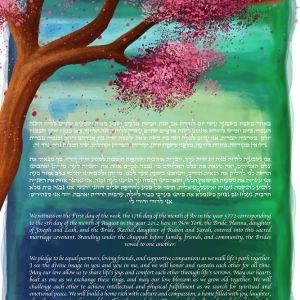 This Ketubah will be a daily source of warmth, love and strength for years to come! With a simple design and gorgeous colors, the Our Paths Ketubah is truly bursting with energy and life! 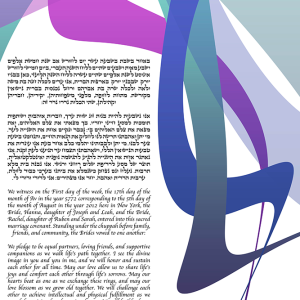 This Ketubah features a colder color palette — each stroke of color overlapping one another to create depth and movement. 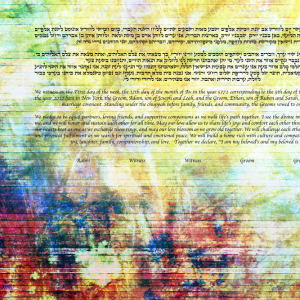 The white background brings out the colors beautifully, while also working to emphasize the Ketubah text. Our Paths Ketubah is perfect for the couple that wants something simple and classic. This stunning abstract design captures the beauty of two life paths merging into one — a new life filled with love and excitement! 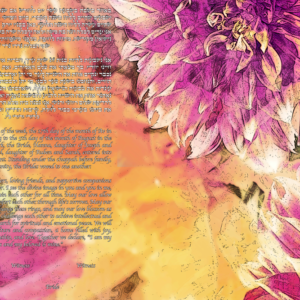 With a stunning design and gorgeous color, The Summers Flowers Ketubah is definitely one of our most unique Ketubahs! This work of art contains tons of color and a lighter backdrop, creating a summertime feel no matter what time of the year you're in. 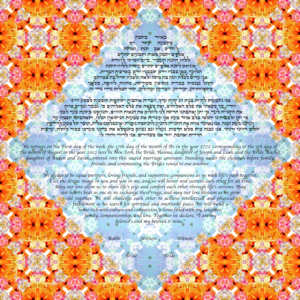 The subtle floral print surrounds the Ketubah text in a diamond format, putting emphasis on what this tradition is all about. The fun blend of floral and optical design makes this the perfect balance for any Ketubah! This design is for the couple who isn't afraid of something completely different… and perhaps loves a good Magic Eye book! The Summer Flowers Ketubah will be a vibrant cornerstone in your new lives together — a life filled with love and warmth. This larger than life, gorgeous floral Ketubah is inspired by the beautiful collection of works by Georgia O'Keeffe. Rather than simply paint what she saw in her surroundings, O'Keeffe would zoom in to the details and beauty of whatever it was she was painting, especially with flowers. The Winter Garden Ketubah utilizes this beautiful idea and brings it to a whole new modern level — with tons of vibrant color of course! 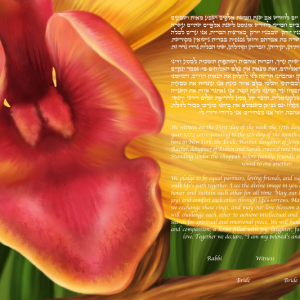 This Ketubah is perfect for the couple that, just like Georgia O'Keeffe, sees beauty in the details. 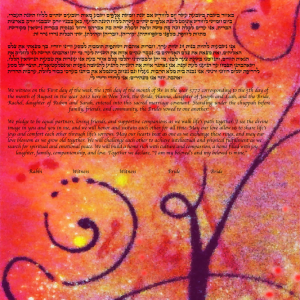 The design and text of this Ketubah balance and work together wonderfully to create a truly stunning design. The Winter Garden Ketubah will look perfect in your home as an important symbol of your love and commitment together. Inspired by the stunning works of Gerhard Richter, The Urban Light Ketubah captures the beauty of a truly compelling abstract design. The darker reds and blues around the edges strike against one another to bring about lighter greens and yellows. Similar to Richter’s techniques, this gorgeous Ketubah utilizes rough textures and simple structure to reveal a softer side underneath. One of our more striking abstract pieces, this Ketubah is perfect for the couple who enjoy the contrast of raw urban style against simple structure and delicate color. The tension and blends of texture and color work beautifully to represent and highlight the dynamics and sides of marriage. The Urban Light Ketubah will emphasis your love and commitment with modern style! With a lively design and tons of textures, it's not hard to guess where the Rainbow Colored Ketubah got its name! This stunning work of art is inspired by traditional Jewish themes and the vibrancy of life and love. Each part of the design contains a different pattern and texture, working beautifully with the geometric lines and abstract style. The Rainbow Colored Ketubah is perfect for the couple that bring life and color to everything they do! Whether you're going on an adventure or just doing day-to-day tasks, you both love to always look at the bright side of things and most importantly… have fun! This one-of-a-kind work of art will be a beautiful representation of your love and tradition! Known as the Mother of American Modernism, Georgia O’Keefe created stunning works of art that captured the detail and raw beauty of nature. Growing up in the mid-west Georgia drew creativity from the dry and sweeping landscapes that surrounded her. The Flowers For Georgia Ketubah is inspired by her unique approach to technique and style — a gorgeous design that exhibits both vibrancy and life! This breathtaking design features an in detail close-up of an orchid flower. The glowing yellows and reds splash beautifully against the green backdrop, working together to truly highlight the Ketubah text. The Flowers For Georgia Ketubah is perfect for the couple that adores the lush outdoors. 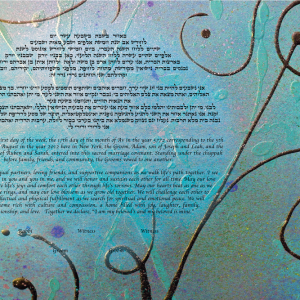 This Ketubah will convey the beauty and powerful commitment of your relationship and love. Part of the Red and Blue Ketubah Series, this Ketubah is inspired by the changing of seasons and the beautiful contrast between warm and cool tones. The Hint of Violet Ketubah exhibits a firey red background accented by lighter yellow tones and striking purple accents. With gorgeous color and a distinct abstract style this design contains a beautiful balance of color, style, and tradition. The Hint of Violet Ketubah is perfect for the couple that is searching for a Ketubah that is simple, yet classic. As a beautiful piece among the Red and Blue Ketubah Series, this design is a beautiful reflection of the beauty and transformation that marriage brings. This work of art will bring central focus to any room of the house — a beautiful symbol of both your modern taste and unique relationship! Part of the Red and Blue Ketubah Series, this Ketubah is inspired by the changing of seasons and the beautiful contrast between warm and cool tones. The Cyan Swirls Ketubah exhibits a chilling background of blended light blues and greens, creating an almost frost-like glow to this design. With gorgeous color and a distinct abstract style this design contains a beautiful balance of color, style, and tradition. The Cyan Swirls Ketubah is perfect for the couple that is searching for a Ketubah that is simple, yet classic. As a beautiful piece among the Red and Blue Ketubah Series, this design is a beautiful reflection of the beauty and transformation that marriage brings. This work of art will bring central focus to any room of the house — a beautiful symbol of both your modern taste and unique relationship!